Paso Robles Vacation Rentals® professionally manages over 100 homes in Paso Robles Wine Country. We have been hosting guests on the Central Coast of California since 2004. This property comes stocked with premium hotel-grade linens and towels, Gilchrist & Soames toiletries, and basic supplies to make your stay in Paso Robles most comfortable. When booking a property with Paso Robles Vacation Rentals® you receive extra benefits and discounts with our local winery, activity, tour and transportation partners. Our local team is ready to help you plan out your perfect trip today! We just finished a 6 night stay at Olive with a Twist. We loved this home. Everything had been renovated and beautifully decorated. The kitchen was well stocked and the bed was very comfortable. We loved the small backyard which was perfect for our two chiweenies to explore. The location was great too. If you stay here, please visit the Odyssey World Cafe which is right downtown. It is partially owned by this home's owners. We ate a lunch and dinner here. It was delicious!! We had a fabulous time in Paso Robles. Thanks Steve and Dawn for allowing us to stay in your historic home. It's no wonder there are so many 5-star reviews-- this is a wonderful home! Very clean, nicely decorated, comfortable, with many thoughtful details in the well-equipped kitchen; bathroom has plush towels and ample toiletries. Loved the short walk into town for dinner, yet the street was nice and quiet with easy parking. Steve is a great guy- very knowledgeable about the area and promptly met us at the appointed time to show us the home. We used to stay in hotels in the area but this home is now our favorite way to enjoy Paso! Olive with a Twist is an updated, super clean, and comfortable property. The location is perfect--a short walk to downtown, easy parking, and in a charming, walkable neighborhood. We're already planning our next stay! This property was absolutely perfect for my husband and I and our two pups. The home is a charming Victorian, lovingly restored. 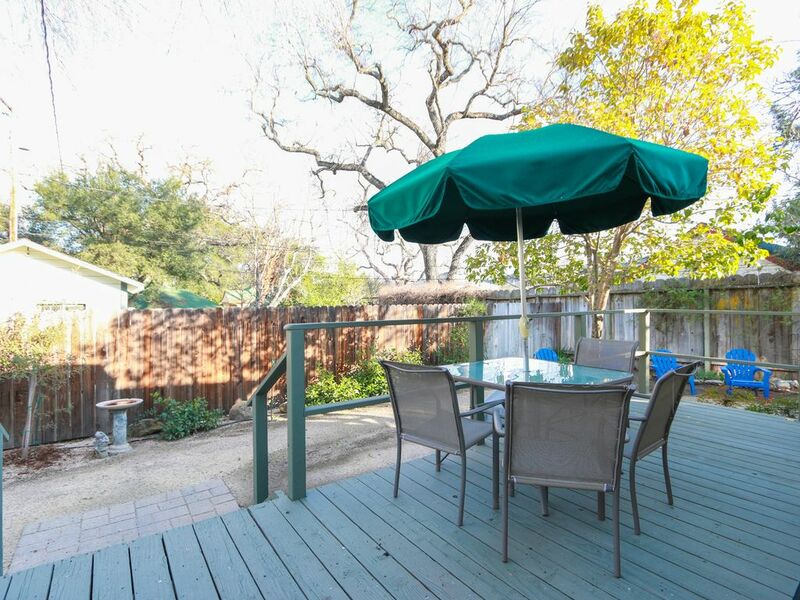 It has a fully fenced in yard, and is fully equipped with every convenience. For us, it's best feature of all is it's location, just a short block from the main square in town. We walk everywhere in town once we arrive. The owner, Steve, is a great guy and the team he works with at Paso Robles vacation rentals are very responsive and good to work with. We'll be back! Just a few blocks from the downtown shops and restaurants. Easily walk anywhere. Great location to many wineries both in town and just a few miles away. Extremely clean and comfortable. Highly recommend this home. Olive with a Twist provided us with a home in a perfect, walkable location to restaurants, with wineries a short drive away. The home is in a quiet neighborhood. The fenced in back yard was convenient for our dog. World Class Wine Tasting & Golf In every direction and all around Paso Robles. There are many restaurants in Downtown Paso Robles. Outdoor Activities Abound: Cycling, Water Sports at the Lake or at the Beach (both 30 - 40 minutes away). Beach Towns of Cambria, Cayucos, Morro Bay, Avila & San Luis Obispo are only Half an Hour Away Lake Nacimiento & Lake San Antonio are only half an hour away too. Boutique Shops and Several Antique Malls in Downtown Paso Robles & Throughout the County & Coastal Cities. Hearst Castle is only a 40 Minute Drive Away. There is a Multiplex Cinema in Paso Robles & Atascadero Showing all Current Releases. There is an Independent Theater Showing Foreign & Independent Films in San Luis Obispo Half an Hour Away. There is a Hot Springs Pond east of Paso Robles if you want to soak in the sunshine or the moonlight - Open Until Midnight. There are Many Things To Do....or You Can do Nothing At All and Just Relax! Holiday and Festival Rates may vary.